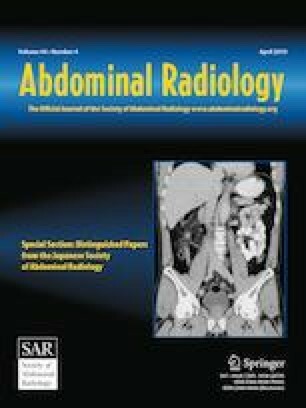 To assess the interobserver agreement of computed tomography (CT) reporting standards for chronic pancreatitis (CP). Retrospective analysis of CT of 47 patients (33 males and 11 females, age range 36 to 56 years) with CP who presented with abdominal pain (n = 41), steatorrhea (n = 37), and glucose intolerance (n = 31). The patients underwent CT study using a 16-multidetector CT scanner with a pancreatic protocol including a nonenhanced scan followed by pancreatic phase at 35 s and portal venous phase at 65 s after intravenous injection of nonionic contrast medium. Image analysis was performed by two radiologists according to reporting standards for CP. There was excellent interobserver agreement (84.8 %) between the two reviewers in CT reporting standards for CP (K = 0.80, 95 % CI 0.75–0.85, P = 0.001). There was good interobserver agreement for pancreatic duct (PD) caliber (K = 0.71, 95 % CI 0.56–0.87, P = 0.001), PD contour (K = 0.76, 95 % CI 0.61–0.91, P = 0.001), PD stricture (K = 0.070, 95 % CI 0.53–0.88, P = 0.001), and distribution of findings (K = 0.69, 95 % CI 0.51–0.86, P = 0.001). There was excellent interobserver agreement for intraductal calculi (K = 0.84, 95 % CI 0.68–0.98, P = 0.001), pancreatic calcifications (K = 0.86, 95 % CI 0.84–0.98, P = 0.001), and pancreatic diameter (K = 0.87, 95 % CI 0.75–0.99, P = 0.001). CT reporting standards for CP is a reliable method for diagnosis of patients with CP. No funding of this research. Informed consent was waived because of the retrospective nature of this study.